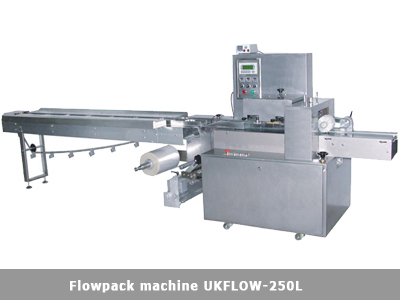 The flowpack packaging machine UKFLOW-250 is used for packing of single or grouped products with an irregular shape and large sizes like pastries, croissants, waffles, Swiss rolls, etc... More information regarding the working method and a general characteristic of the flowpack packaging machines can be found here. Packaging material Thermo-sealable film like PP-PP, PP-PE, PA-PE, PE-PET and others. 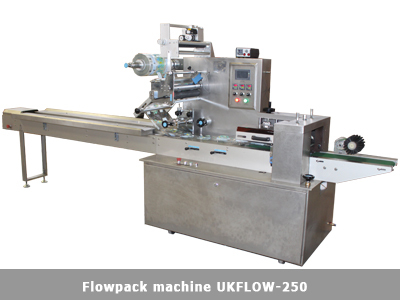 Video 1: Flowpack packaging machine UKFLOW-250. 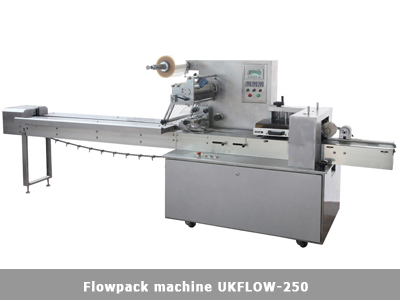 Video 2: Flowpack packaging machine for packing single-piece biscuits. Video 3: Flowpack packaging machine for packing tray packed confectionery.